What’s the Best Shampoo for Hard Water Showers? Home > Hair Care > Dry and Damaged Hair > You Asked, We Answered: What’s the Best Shampoo for Hard Water Showers? No, it’s not your imagination: Your hair CAN look different after showering in someone else’s pad. Mineral deposits, like calcium and magnesium, contribute to a lesser lather in hard water. First off, let’s discuss: Hard water, as ominous and unforgiving as it sounds, isn’t really harmful to one’s health. It’s simply water with high mineral content, most often calcium or magnesium, and is the main culprit in soap scum and crusty shower heads. In some cases, as with a lot of Pre-War apartments with steel pipes (holla at your girl, Midtown neighbors! ), it manifests as iron oxide (a.k.a. yep, rust) as red rings in your toilet bowl and shower drains. But relax, before you rush to the E.R. demanding for a tetanus shot, know that for the most part, this is non-toxic. Common effects on hair, at least in less extreme cases (which is where us New Yorkers fall on the spectrum) include resistance to lathering and more buildup, which can make hair harder to style. The mineral content can also react with your dye job, which is why a lot of us may experience brassiness a few days into a new shade. Like me. Sniff. That said, you can probably guess that the best shampoo for hard water is one that clarifies buildup and residue. 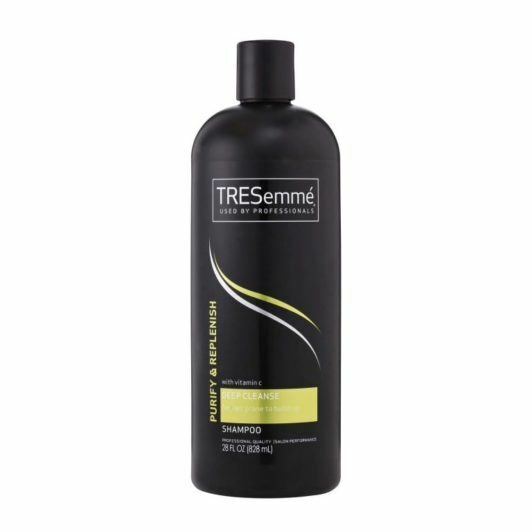 Cleansing your locks once a week using a deep clarifying wash-and-care system, such as TRESemmé Purify & Replenish Shampoo and Purify & Replenish Conditioner, will allow you to cleanse frequently without drying out your hair. There are adventurous souls out there that also swear by a vinegar rinse for your locks when you feel the need to de-crud (half water + half vinegar in a spray bottle, in case you were curious) but for the less Pinterested, a pre-poo treatment can also help matters. Just as it locks out water to prevent a new color or moisture from leeching out, it can also help shield your locks from any mineral deposits from hard water. I personally love the nourishing benefits of Nexxus Color Assure Pre-Wash Primer, which has both coconut and Argan oil that works to moisturize and provide shine and vibrancy to your hair. Apply a couple of pumps to dry hair before showering, and shampoo as usual. Prevention, as they say, is always better than cure—and till I move into my dream glass-windowed home in the islands, where I lather up via fresh rainwater and sleep under a blanket of shooting stars, these will be my next best lines of defense. The Best Deep Conditioner for Damaged Hair.